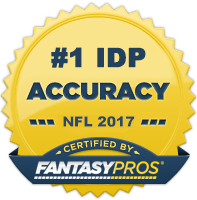 In IDP leagues that issue points for return yardage, fantasy owners can get a little more creative with their defensive back selections. Often times relatively unknown secondary players can produce at a higher than "normal" rate due to their role as return men. Even defensive backs who are strictly limited to third down nickel packages can have nice value in these leagues due to their return yardage production. Listed below are defensive players who have a possibility to return either kicks, punts, or both this season. A lot of these players are backups in most defensive packages; however, there are a few who actually start on defense as well. I've notated which players are starters and which players are bench players. Much like Sports Betting, gambles have to be made when selecting IDP return men in your drafts. For some of these players, their special teams designations may not be confirmed until very close to the start of the season and players may fail to become the team's primary return man. However, by keeping up with the latest news and coaches reports, we can make our best educated guess about which players will be the likely return specialists come Week 1 which will ultimately take us one step closer to that coveted Fantasy Football Championship. Feel free to call out any omissions or necessary changes to the list in the comments section below. This list will continually be updated throughout the regular season.